KitMonsters – Fender Jazzmaster. The music makers’ guide to making music. 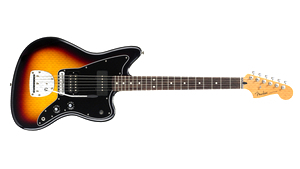 Originally intended as an up-market sibling to the Fender Stratocaster, the Jazzmaster was launched in the late 50s and aimed at jazz guitarists. Features such as the mellower tone, and contoured ‘offset-waist’ body, were designed for playing the guitar sitting down (common for jazz players at the time). However, it was not widely embraced by the jazz community, instead becoming popular amongst surf rock guitarists in the 60s. 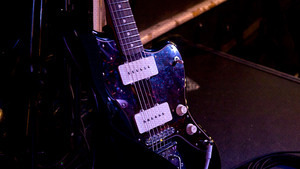 Later discontinued, the guitar got a cult following in the world of alternative rock in the 80s and 90s and was popular with bands such as Sonic Youth, Dinosaur Jr and My Bloody Valentine. The design quirks of the guitar which made it less popular in the past, allowed these new artists to experiment with guitar sound in new ways, particularly with the use of the 3rd bridge technique, and creative use of feedback. 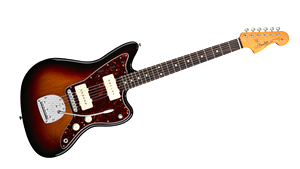 Today many reissues of the Jazzmaster are available, and it is widely used across a variety of genres and artists.